So how does it feel like to spend the whole afternoon with 3 of the loveliest moms in the industry? They are all relate-able moms! They are extremely down-to-earth, friendly and funny! I thank God for giving me the opportunity to attend this workshop because it was indeed a refreshing experience especially for hands-on working mom like me! The room was filled with moms from different fields! Moms who have babies, toddler and teenagers! Some are moms of 2, 4 and 6! Before the workshop, I used to think my life revolves just around my son, but after the workshop, I realized, some moms who attended the 2nd 100% Whole Mom are even more busy than me but hey, they know how to take a breather, they know they need time for themselves thus they are gifting themselves with this workshop! And it was a great gifting idea for yourself --- to nurture and feed yourself, both from the outside and inside. And I think that's 100% Whole Moms is all about! To officially start the workshop, Marilen Faustino-Montenegro, putting "Model" term aside, is actually a talented interior designer. She started off by sharing how it is important to have an organized home to create a nice "flow" for the family. How? By organizing the things at home, creating clutter-free space to save time whenever you need to move around in trying to finish your daily tasks. She shared so many practical tips we tend to forget and there were also new ones that I am starting to include in my daily regimen! Thanks Marilen! Then Cheska shared tips on how to be "Simply Beautiful". 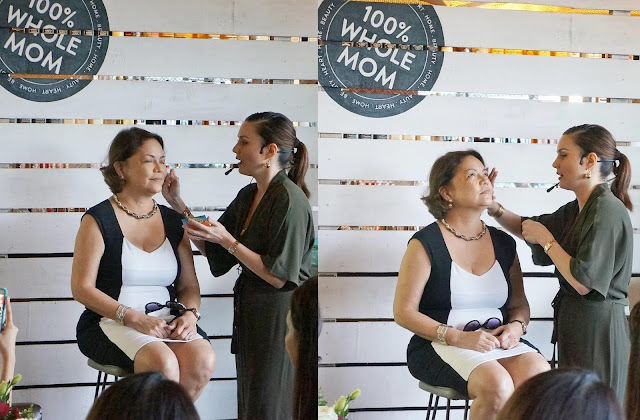 She shared practical tips on how to stay pretty even for moms who don't have enough time! She even shared her "kikay kit" which was housed in a Ziplock bag! So cute yet very innovative! Cheska also did live demo on how she would do a quick-day time look and she used all Happy Skin products on her gorgeous mom! Then, the last part was when Rica shared everything about the HEART. It is important for all moms to know that for all the external activities we do, we need to feed what's inside our hearts. The 2nd workshop partnered with Debenhams and we also took a pick on quick fashion styling done by the 3 gorgeous moms! I can totally wear all the pieces that was showcased during the workshop! Functional, multi-purpose and very comfortable to wear are what mommies like me want to be included in their wardrobe. Check out all the attentive mommies! Congratulations Marilen, Rica and Cheska! I'm sure you will help a lot of moms out there! Thank you so much Marilen for the invite, I had so much fun! I'm single yet I want my friends to know about this workshop! go lang! may mga single attendees pa nga eh!